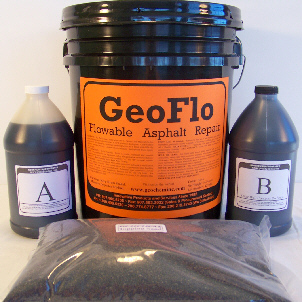 GeoFlo Rapid Repair Asphalt Slurry is one of our best asphalt crack fillers. Supplied in five gallon kits for reconstruction of deteriorated asphalt with NO ASPHALT REMOVAL, this asphalt crack filler is suitable for narrow or wide cracks, alligatoring, and both large/deep and small potholes. For the rapid repair of cracks and potholes, trust PERCOL GeoFlo.